The Ruvuma Region of Tanzania is in the south of the country bordering on Malawi to its west and Mozambique to the south - its land area is similar to that of Scotland. It is one of the most remote and impoverished areas of the country; it has no rail links and is 14 hour bus journey from Dar es Salaam. The region does not benefit significantly from Government aid because of its lack of accessibility; as a result national and charity development projects are generally situated in areas with a better infrastructure. The original Ruvuma Development Association (RDA) was registered in the early 1960's when, encouraged by Julius Nyerere the first president following independence, a number of communal villages joined together and organised themselves into what became known as the Ujamaa villages. 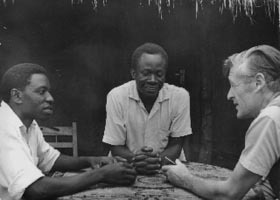 The driving force behind the Association was Ntimbanjayo Millinga who was the secretary of the local branch of the Tanzanian African National Union Youth League and he was supported by Ralph Ibbott, an English quantity surveyor who acted as an advisor and agreed to live and work with his family in the village of Litowa. The emphasis on the development was based initially on improving agriculture, leading quickly to self-sufficiency. As a result health improved, and mortality rates amongst children dropped dramatically. Education was developed in an experimental way at the school in Litowa the first of those communal villages, creating its own curriculum and integrating its educational work with the on-going life of the villages. Village industries were developed in conjunction with agriculture practice. These included milling, knitting and weaving and were taught by Noreen Ibbott. Building skills of bricklaying, carpentry and joinery were also developed and knowledge was gleaned from volunteers from overseas who were supported by charitable aid programmes. They came to spend extended periods of time in the villages and pass on their particular skills. In 1963, the Chairman of the RDA was the Ruvuma Regional Commissioner and together with village representatives, there were the relevant TANU party officials and civil servants involved. Difficulties soon arose as many party and government officials became unhappy at having to deal with the democratic ideology of the RDA and it became difficult to get the chairman to call meetings. As a result during a visit by the President to Litowa village permission was sought for the RDA to have a new constitution detached from government and entirely run by its communal village membership. In the interest of spreading the idea of these Ujamaa villages, Ntimbanjayo Millinga became an MP. President Nyerere, with the same objective in view then appointed Millinga to a new post in the TANU youth League and later in the Party Headquarters. In the late 1960's the President put great effort into the education of party officials and senior government officers in the principles of Ujamaa. However these initiatives seemed to produce a strong antipathy towards these ideas amongst the majority of the national leadership. In September 1969 at a meeting of the TANU party's central committee the President was voted down by a huge majority and the RDA was banned – Party and government would take over. The property of the Association was confiscated, the Ibbotts and staff left the country within a few days, and teaching staff in the school was dispersed across the country. Some five years later the government instituted the 'villageisation' project whereby all peasant families across Tanzania were collected into villages. This was said to be done in the interest of providing better health and educational services. The smaller RDA villages disappeared and the families were forced into new villages. 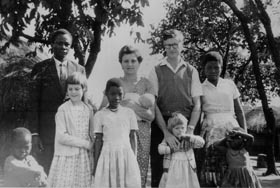 The larger villages like Litowa grew to accommodate a large number of new families under the government programme. As a result the spirit of RDA was extinguished. 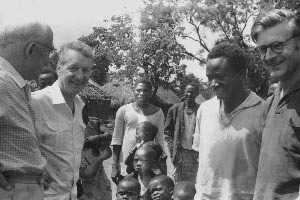 In 1992 Ralph Ibbott and his wife revisited Tanzania for a month and met up again with Ntimbanjayo Millinga, whose intention was to retire from politics in a few years. He believed that the changed political situation would enable development projects to be pursued again using the experience gained in the 1960's. He asked whether resources in the UK might be available to initiate action should young people in the villages be interested. RUDA was established in the UK with an office in Songea and various projects followed. Developing the introduction of organic paddy field rice production and help with marketing strategies. Organising seminars in the use of coal for brick making and domestic use thereby preventing deforestation. The development of simple electricity generating windmills, particularly for use in schools. These would be self-build and maintained. Tackling land degradation on the shores of Lake Nyasa. The manufacture of agricultural tools. The development of small-scale coal mining for local use. Supporting the new Solifo Secondary School at Hanga. RUDA originally operated from a base in Songea but due to difficulties with some of the members we closed this office and now work from the UK. We sadly lost Ntimbanjayo Millinga who died in 2008 but are supported by his wife and family all of who are working hard to make the current school project to build the Ntimbanjayo Memorial School of Excellence a success.